Last week in Washington, DC, sights like the Lincoln Memorial and the new Martin Luther King Memorial made me think about the history of slavery. A film now in theaters examines slavery, and race, from a unique perspective. 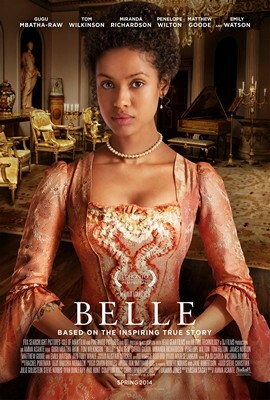 “Belle,” written by Misan Sagay and directed by Amman Asante, is a 2013 film about a real person, Dido Elizabeth Belle. She was the niece of William Murray, 1st Earl of Mansfield and Lord Chief Justice of England and Wales. She was the daughter of his younger brother, a Royal Navy Admiral, and a free black woman who had died. She was left in the care of her uncle to be a companion to her cousin, Lady Elizabeth Murray. Belle was raised as an aristocrat even though she was black. In the film, certain lines are drawn: Dido is not allowed to sit with the family at evening dinners when there is company, but she is welcome in the drawing room afterward. Actually, little is known about Belle’s life, but the filmmakers have fashioned an absorbing story based on real-life events close to Belle. Just as she was coming of age, Belle’s uncle had to decide a notorious case in which owners of a slave ship, the Zong, had thrown their cargo of slaves overboard in order to collect the insurance on their “property.” The Lord Chief Justice’s ruling was eagerly anticipated all across England. If he went one way, slave traders would have a free hand in the future. If he went the opposite way, his ruling would spell the beginning of the end of slave trading in England. To further complicate matters, Belle inherits a sizable fortune on the death of her father, while her white cousin is penniless. Suddenly Belle has aristocratic suitors. In the movie, Belle’s forbidden romance with a passionate, idealistic but impoverished young lawyer influences her uncle’s eventual decision. The luminous Gugu Mbatha-Raw plays Belle. The stellar cast includes the great Tom Wilkinson as the uncle, as well as Miranda Richardson, Penelope Wilton, Sam Reid, Matthew Goode, Emily Watson, Sarah Gadon, Tom Felton, and James Norton. In 1779, Belle’s uncle commissioned a portrait of his two young nieces. 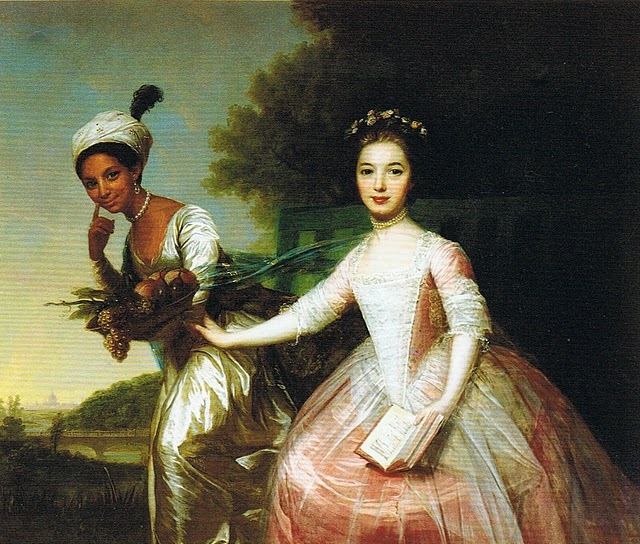 The portrait is unique because it is one of the very first paintings that depict a black aristocrat as an equal to a white aristocrat. The painting, by an unknown artist, hung until 1922 at Kenwood House in Hampstead, where Belle grew up. It is now at Scone Palace in Perth, Scotland. Join me next time for more explorations in the art and history of Europe! This entry was posted in Art, British Isles, England, Scotland and tagged "Belle" movie, Amma Asante, Dido Elizabeth Belle, Emily Watson, Gugu Mbatha-Raw, James Norton, Mathew Goode, Miranda Richardson, Misan Sagay, Penelope Wilton, Sam Reid, Sarah Gadon, slavery trade in England, Tom Felton, Tom Wilkinson, Zong massacre on June 13, 2014 by Claudia Suzan Carley.